The most importand happening in human history is since 2008 on this website presented. Mediterranean refill about 3500 BC. The second most important happening is the confirmation of the refill. By the detection of Poseidopolis both of them are proven. Poseidopolis central position: 33.34 north: 24.13 east. At deep 1940 m. Five times bigger area then Manhattan. This is the very first created vision of Poseidopolis in accordance with the deteced layout. * New worldrecord was set 17/11 2017 for a painting. 3,8 billion SEK for Salvator Mundi by Leonardo da Vinci. Set price for each replika 1 000 000 SEK. With the towns total area the population is estimated to about 300 000 inhabitants. They tried to escape the flood on their nearby highest hill. That hilltop is seen in background and is at a deep of 1528 meters. That hilltop has gold, bronze and other, then most valuable, leftings gathered by the people that lived in Poseidopolis and the east part of Basileia. 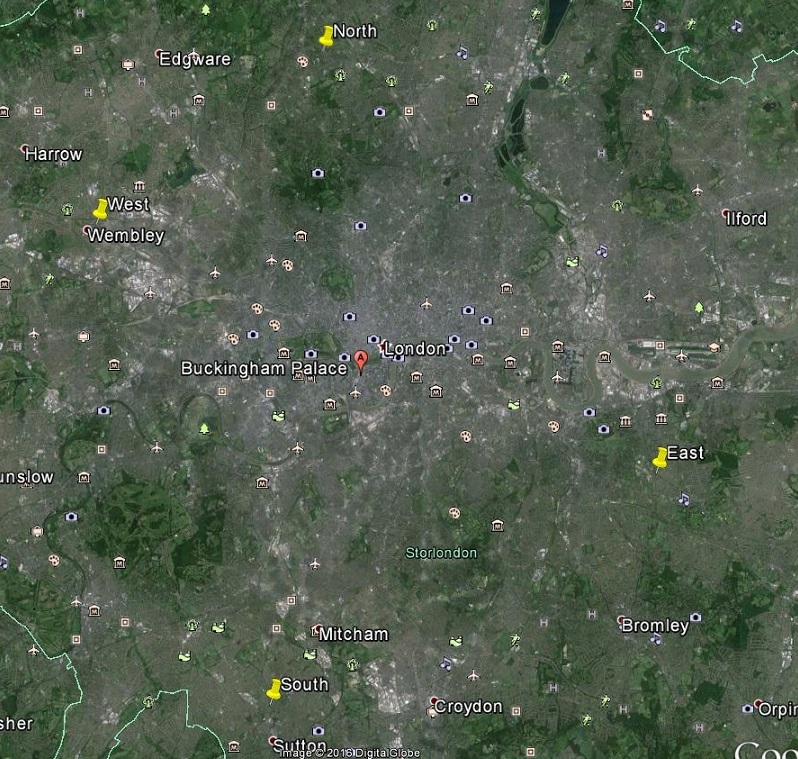 Detected layout made by Google Earth. 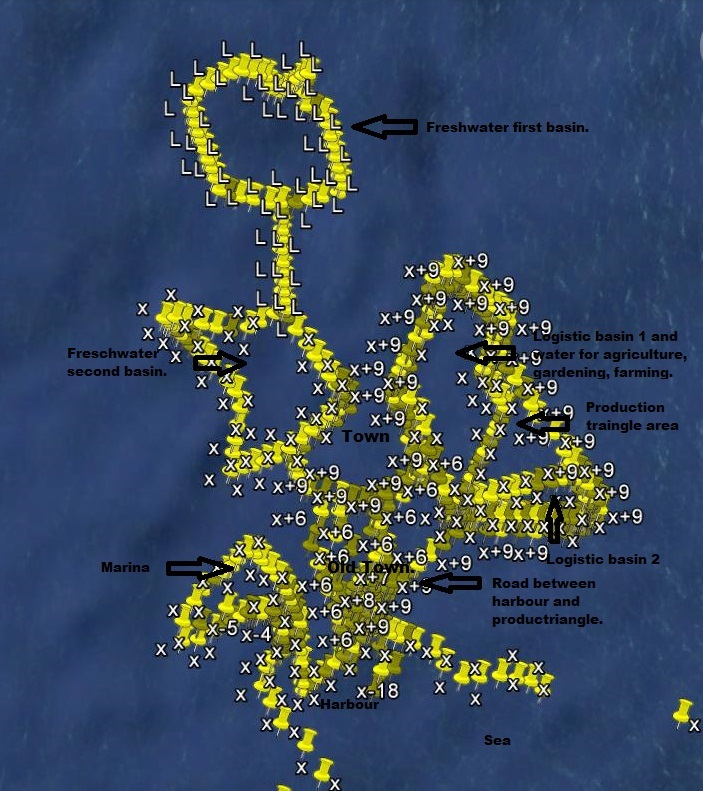 2008 Atlantis and Poseidopolis was due to analysis set in accordence to picture above and is since then public on this website! The analysis was an exact hit! Conclusion: That such, a not human construction, randomly was at the forecasted place for Poseidopolis are two probabilities multipled: one chans/( billions x billions ). Extension of Poseidopolis is set with coordinates below. 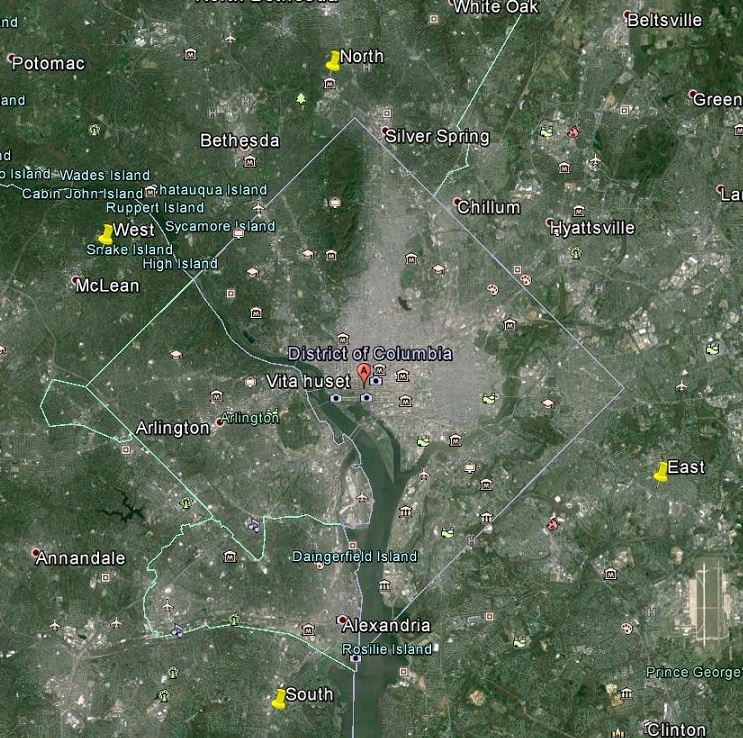 To understand the size the same area is placed in Stockholm, London and Washington DC. 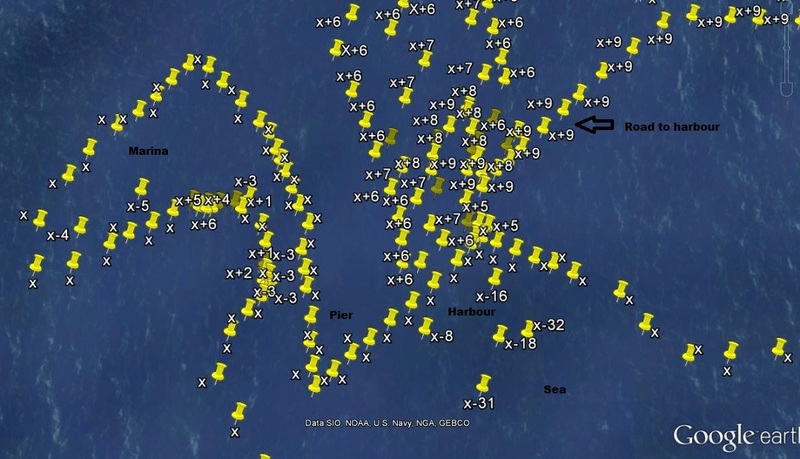 The positions W, N, E and S are in Googlepictures below marked with pins. Poseidopolis placed in Stockholm. Posedopolis center is Stockholm Slott. Poseidopolis placed in London. Poseidopolis center is Buckingham Palace. Poseidopolis placed in Whashington DC. Poseidopolis center is the White House. Atlantis mainisland, Basileia, is the top of the Mediterranean ridge.The lengt was 250 km and widest 110 km. 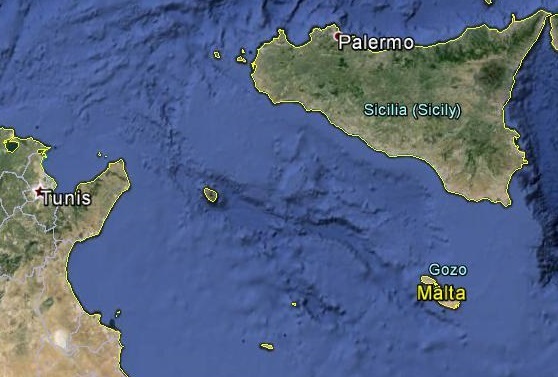 The area 16800 km2 about twice as big as todays Crete. Basileia was plain and most the island had probably very good conditions for agriculture. Gardening, agriculture and domestification of animals was far ahead other civilisations even around the Mediterranean. Efficient foodsupply gave resources for education and progress in all topics. 2008 the flood was descriebed. 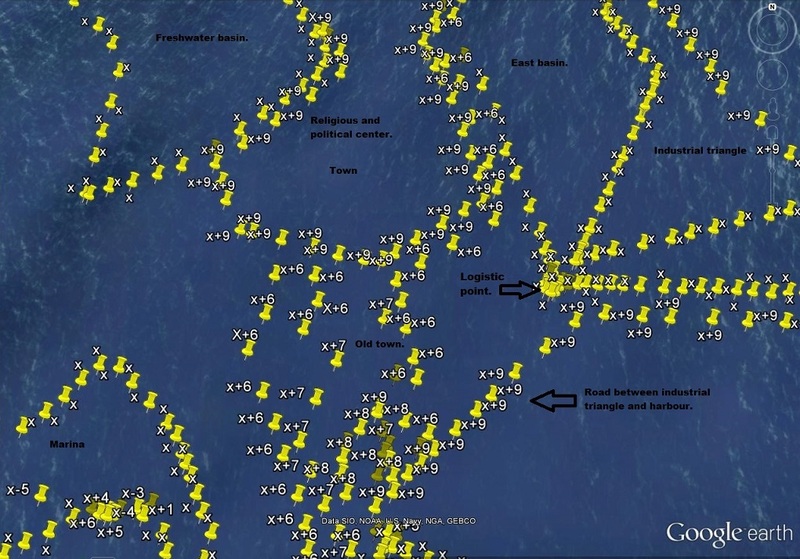 2015 about 1 billion internet-users on Google Earth can confirm the flood. As explained the Sicilanic ridge, about -300, was overflooded and eroded about 50 meters and initala caused a much bigger into east Mediterranean then that thrue Gibraltar strait. The channel east of Pantelleria is more then 30 km wide and down to -1700 m.
This is the east part where production is separated by the basin from town of Poseidopolis, Atlantis. Old town is a settlement without a plan. Town, water and foodsupply, are later very well planed that gives that Poseidopolis, Atlantis, has a good leadership that among the inhibitants has authority and high credibility. Logistic solution. 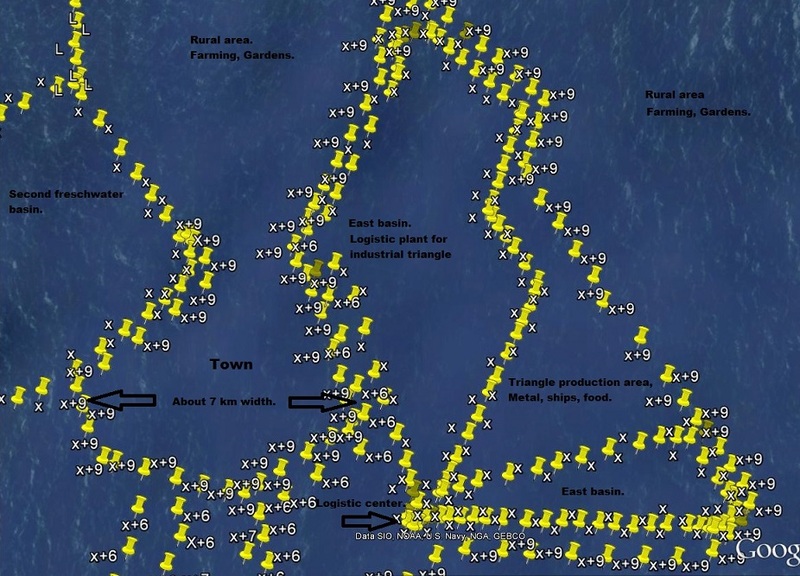 Shiploads can reach very deep into the town by the triangle solution. Marina and harbour of Poseidopolis, Atlantis. The water supply for the capital was essential. The fluvial system to serve for water supply has very little extend. 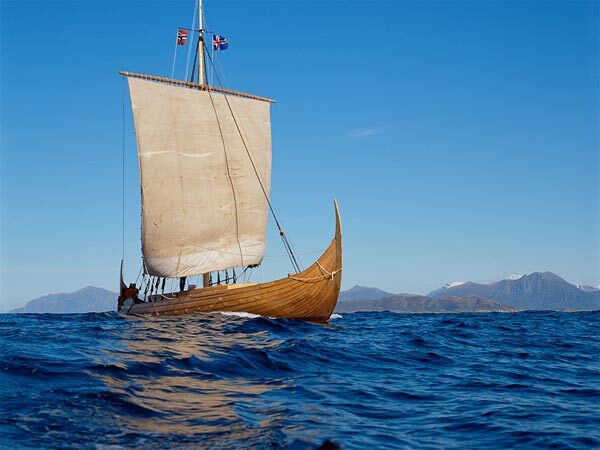 Atlantic ships were probably very alike viking ships. A manufacturing skill used many generations later by atlantic descendants in Scandinavia. 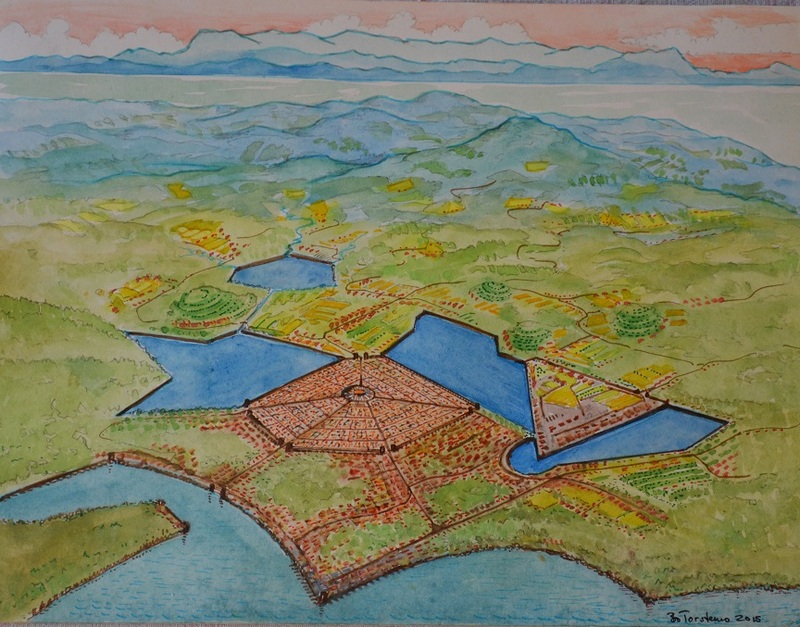 Analysis gives that a well accepted political decision among the atlants is to use the masses digged out of the basins and plain the hilly area for a new center and expanding old town. West basin used for freshwatersupply and fish. East basin for fish and transports of material used in industri. Industrial area was most probably also used for cattle and diary production. 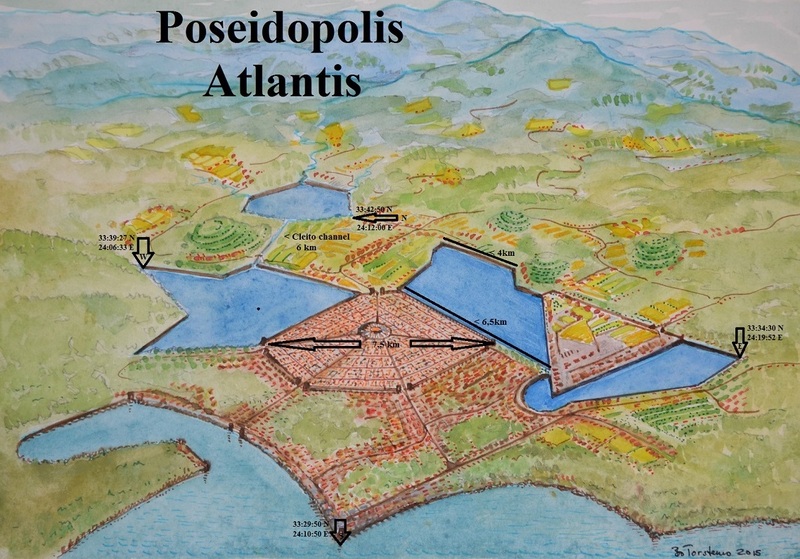 Analysis of the founding of Poseidopolis,Atlantis. The myth tells that Poseidopolis was built and separated with three rings filled with water. Drawings that tries to reproduces the mythical town are made with three cirkular mouts with it´s religious and political center in the center ringa. That is wrong. Poseidopolis has two basins to the east of the town and one to the west. 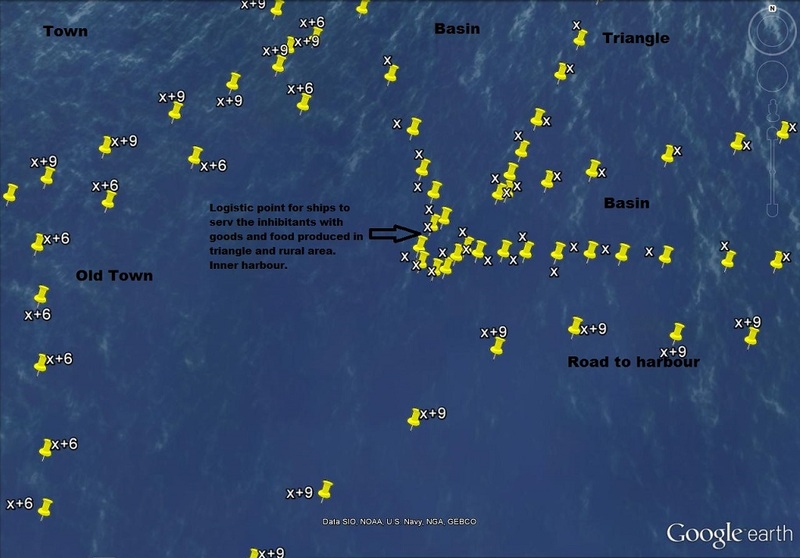 The east basins are devided by a triangle and are connected at the triangletop with each other. The construction is a very well logistic solution when using boats to carry heavy loads. It minimizes the distance to the town with maximum access to the basin for industri on the triangle. Right opposite the triangle top there is a basinharbour. That is the logistic center for goods and labour and with a very litle extend in the town its inhibatants are served with everything that are produced in the industrial area. Modern thinking with production separated from living. Production is here also included food production. Cattle and diary products, fruit and vegetables gardens. The basin lenghts are at maxium about 11 km and 7 km respectively. 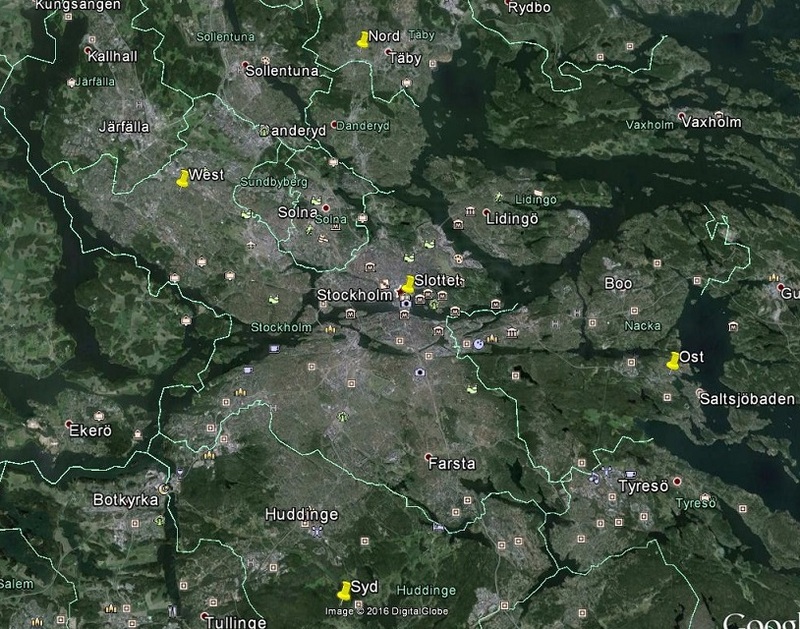 The areas about 40 km2 and 11 km2. The industrial trianglearea about 20 km2. 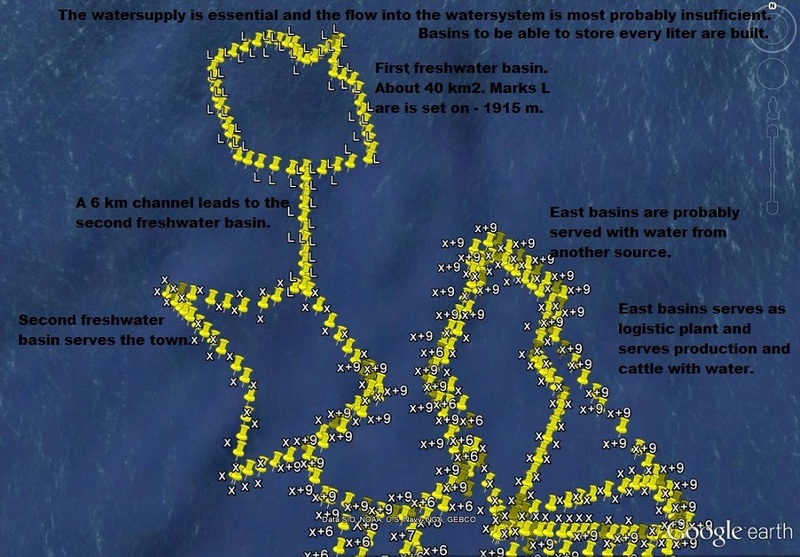 The basins are at the size that they also was used for a significance fishproduction and maybe also dolphines. Foodwaste from the households was throwed into the basins as was used as food for the fishproduction. The west basin is freschwaterbasin and kept out of polution factors as industri and cattle. West basinarea about 45 km2 and is the second basin. The first freschwaterbasin is 5 km north and about the same size. A channels leads the freshwater from the first basin owerflow to the second basin. All freshwater is efficient used and probably serves the basins also as waterreservoirs during the summerperiod when more freshwater is used then filled up. 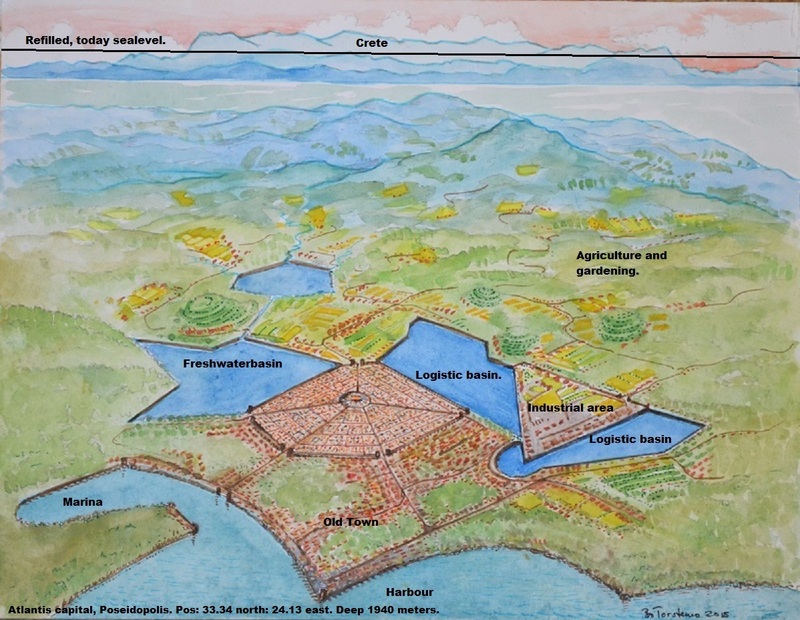 Poseidopolis is very well planed to be a efficient civilisation and settlement. Planed to serve it´s inhibitants needs. It is also a very longterm project as masses digged out from basins are used to bild up the new central town level and the industrial traingel. A rising population very well served with food and water. These kind of big projects are possible only after political decissions and most probably very political accepted among the inhibitants as they primarly served their needs. Posedopolis most probably had a strong leadership where authority was based on sucess with peoples wealth. The basins and town are projects are decisions and work made by people that was established in the oldtown close to the sea and it´s harbour. The rising population had bad expanding areas as it was hilly in direction north along the ridge and and on both sides were swamps. That was the startconditions for the political decission to build up the town and dig out the basins. From the east basin leads also a road to the harbour att sea that serves for import an export. For orichalcon produktion, (bronze ), was ore and energi needed that came from other places. Also shipproduction was done on the industrial area and wood had to be imported. The analyses was published at website 16/1 2015; Layouts of Poseidopolis was on this website published 21/1 2015. All drawings based on the descriptions are Carl Festins copyright.